Best remembered for seasonal favorites like “Rudolph, the Red-Nosed Reindeer,” composer Johnny Marks was born in Mt. Vernon, NY on November 10, 1909. After attending Columbia University, he studied music in Paris, returning stateside to work as a radio producer; during World War II, Marks additionally produced entertainment for American troops stationed overseas. In 1947, he was asked to write a song based on “Rudolph, the Red-Nosed Reindeer,” a poem written by his brother-in-law Robert L. May, a copywriter with the Montgomery Ward department store chain. Ward’s had already given away six million illustrated copies of May’s story before Marks even composed a note, but the song itself (popularized by Gene Autry’s 1949 recording) still sold over 30 million copies in the decades to follow, inspiring a beloved television special which premiered in 1964. Marks also authored several other yuletide classics, including “Rockin’ Around the Christmas Tree,” “A Holly, Jolly Christmas,” “When Santa Claus Gets Your Letter,” and “Silver and Gold”; a member of the Songwriters Hall of Fame, he died September 3, 1985. Rudolph the Red-Nosed Reindeer, 1949? 1952 — The Night Before Christmas Song — music by Johnny Marks; lyric adapted by Marks from the well-known Clement Clarke Moore poem, originally titled “A Visit from St. Nicholas” (1823). Marks’ adaptation was recorded as a duet by Rosemary Clooney & Gene Autry in 1952, and by the Ames Brothers in 1955. Rudolph the Red-Nosed Reindeer is a character in a story and song of the same name. The story was created by Robert L. May in 1939 in response to a job assignment while employed as a copywriter with the retail company Montgomery Ward. In 1939, Montgomery Ward asked one of their copywriters, 34-year-old Robert L. May, to come up with a Christmas story coloring book they could give away to shoppers as a promotional gimmick. May, rather sickly, shy and introverted as a child, based the story on his childhood feelings of alienation from children of his own age. As to the name, May considered and rejected Rollo (too cheerful) and Reginald (too British) before deciding on Rudolph. Montgomery Ward distributed 2.4 million copies of the Rudolph booklet in 1939, and although wartime paper shortages curtailed printing for the next several years, a total of 6 million copies had been given by the end of 1946.The post-war demand for licensing the Rudolph character was tremendous, but since May had created the story as an employee of Montgomery Ward, they held the copyright and he received no royalties. Deeply in debt from the medical bills resulting from his wife’s terminal illness (she died about the time May created Rudolph), May persuaded Montgomery Ward’s corporate president, Sewell Avery, to turn the copyright over to him in January 1947. With rights to the Rudolph story in hand, May’s financial future was now secure and his life had taken a happier turn. In 1947, Rudolph the Red-Nosed Reindeer was released commercially in book form. However, Rudolph’s popularity soared when May persuaded brother-in-law and songwriter Johnny Marks to create a song based on the story. In 1948 a nine minute cartoon, directed by Max Fleischer and featuring the song by Marks, was shown in theaters. Rudolph made his first screen appearance in 1944, in a cartoon short produced by Max Fleischer for the Jam Handy Corporation that was more faithful to May’s original story than Marks’ song, which had not yet been written. It was reissued in 1949 with the song added. Most of the copies of the film that I’ve found at YouTube and in other videos libraries have been dated 1948, though occasionally I’ll find one dated 1944, and in one present case a YouTube provider dates the film “1944/1948.” I am currently unable to find a copy of the film anywhere that is dated 1949. With the exception of the Library of Congress version described above, in each copy of the film that I’ve encountered online the Johnny Marks title song plays in the soundtrack during the opening credits, and again in a brief reprise at the conclusion. Again, most of these copies of the film are dated 1948, not 1949. On the third page of the opening credits of this version of the film, Johnny Marks is credited with contributing “Song-Words and Music,” and his song “Rudolph the Red-Nosed Reindeer” is the only song in the soundtrack. Two decades before Rudolph came to the small screen, Robert L. May’s enduring creation was given the Max Fleischer special touch in this nostalgic cartoon. Johnny Marks’ infectious song leads into the well-known story of Santa’s Winter weather troubles & how the bullied little deer saved the day/night. A few of the graphics are reminiscent of Fleischer’s splendid SUPERMAN series. The cartoon adds some new details to the story – Mama Rudolph in a dress & apron is a rather strange sight – but basically this version, narrated by Paul Wing, laid the groundwork for later adaptations. While rather obscure, if uncovered this would make a fine addition to a family’s Christmas Eve viewing. Despite the date given by the video provider, the following video may contain a 1949 (or later) version of the film, as I’ve suggested above. As mentioned above, the Library of Congress has a 1948 version of the film that does not include the Johnny Marks song “Rudolph the Red-Nosed Reindeer” in its soundtrack, or any other song by Marks. Rudolph the Red-Nosed Reindeer (song) — 1949? Robert L. May’s 1939 book in verse “Rudolph the Red-Nosed Reindeer” was first commercially published in 1947, the year in which he acquired the copyright to his work. In his Johnny Marks biography, Jason Ankeny indicates that 1947 was also the year that Johnny Marks, May’s brother-in-law, was asked to write a song based upon the poem. Most sources say that Marks wrote the song, adapting its lyrics from the poem, in 1949. Perfessorbill.com gives 1949 as the copyright date of the Johnny Marks song. Marks sent a demonstration recording to RCA Victor recording artist Perry Como, but the pop singer turned it down when the composer wouldn’t allow him to change any lyrics. Marks later confessed to Gene [Autry] it had been rejected by Bing Crosby and Dinah Shore as well. The Autry recording, credited to Gene Autry and the Pinafores, was issued in 1949 on the singles Columbia MJV-56 (also MJV 56) and Columbia 38610, each backed with “If It Doesn’t Snow on Christmas” (Gerald Marks, Milton Pascal). This is the first recorded version listed by SecondHandSongs.com in its page on the song. Rudolph the Red–Nosed Reindeer is a long-running Christmas television special produced in stop motion animation by Rankin/Bass. It first aired December 6, 1964, on the NBC television network in the USA, and was sponsored by General Electric under the umbrella title of The General Electric Fantasy Hour. The copyright year in Roman numerals was mismarked as MCLXIV instead of MCMLXIV. The special is based on the song by Johnny Marks, which was in turn taken from the 1939 poem of the same title written by Marks’ brother-in-law, Robert L. May. Since 1972, the special has aired over CBS, which unveiled a high-definition, digitally remastered version in 2005. As with A Charlie Brown Christmas and How the Grinch Stole Christmas, Rudolph no longer airs just once annually, but several times during the Christmas and holiday season. It has been telecast every year since 1964, making it the longest running Christmas TV special, and one of only four 1960s Christmas specials still being telecast (the others being A Charlie Brown Christmas, How the Grinch Stole Christmas, and Frosty the Snowman). WARNING: See the article 4 Bad Lessons ‘Rudolph The Red Nosed Reindeer’ Teaches Kids, by Jeff Benion, published at Cracked.com on 19 December 2010. Longfellow wrote “Christmas Bells” on Christmas Day 1863 in the midst of the American Civil War and the news of his son Charles Appleton Longfellow having suffered wounds as a soldier in the Battle of New Hope Church, VA during the Mine Run Campaign. He had suffered the great loss of his wife two years prior to an accident with fire. His despair in the following years was recorded in his journal. Although Decca released [Brenda Lee’s recording of Rockin’ Around the Christmas Tree] in both 1958 and again in 1959, it did not sell well until Lee became a popular star in 1960; that Christmas season, it hit #14 on the Billboard pop chart and turned into a perennial holiday favorite. It continued to sell well during the holiday season, hitting #5 on the Christmas chart as late as 1984. Brenda Lee’s recording still receives a great deal of airplay. Despite the song’s title, its instrumentation also fits the Country genre which Brenda Lee more fully embraced as her career evolved. Despite her mature-sounding voice, she recorded this song when she was only 14 years old. The recording featured Hank Garland’s ringing guitar. For decades, Brenda Lee’s recording was the only notable version of the song. Radio stations ranging from Top 40 to Adult Contemporary to Country Music to Oldies to even Adult Standards played this version. The Tiny Tree is a 1975 animated TV Christmas special, produced by DePatie-Freleng Enterprises. The special features eight Johnny Marks songs (not all having Christmas or holidays themes) including two sung by Roberta Flack, “To Love and Be Loved” and “When Autumn Comes.” Flack also co-produced and co-arranged these two songs, with Leon Pendarvis. Buddy Ebsen is the narrator and voice of Squire Badger. “When Autumn Comes” begins at about 13:28 in the following video. 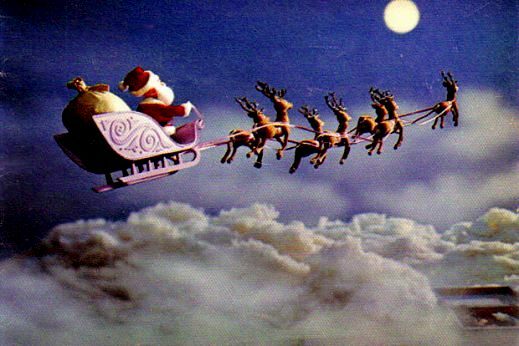 The 1964 showing did not have Santa picking up toys from the Island of Misfit Toys at the end. A letter-writing campaign ensued and the new ending was added in 1965. Also in 1965, sponsor General Electric insisted on replacing the song “We’re a Couple of Misfits” with “Fame and Fortune”, a change that lasted until 1998, when “Misfits” was put back in. The description of “Fame and Fortune” by IMDb on the “Soundtracks” page as an “Alternative version of “We’re A Couple of Misfits”” is inaccurate. They are entirely different and unrelated songs. A beautiful story that should be seen by all children Young and old. Does anyone know if it is available in DVD? I would like to purchase a copy of the sheet music to I’ll be a little angel ..please let me know how to find it. Thank you.